Sunrise Luxury Villa-Breath Taking View! Villa Sunrise is located on upper St. Jean Hillside. 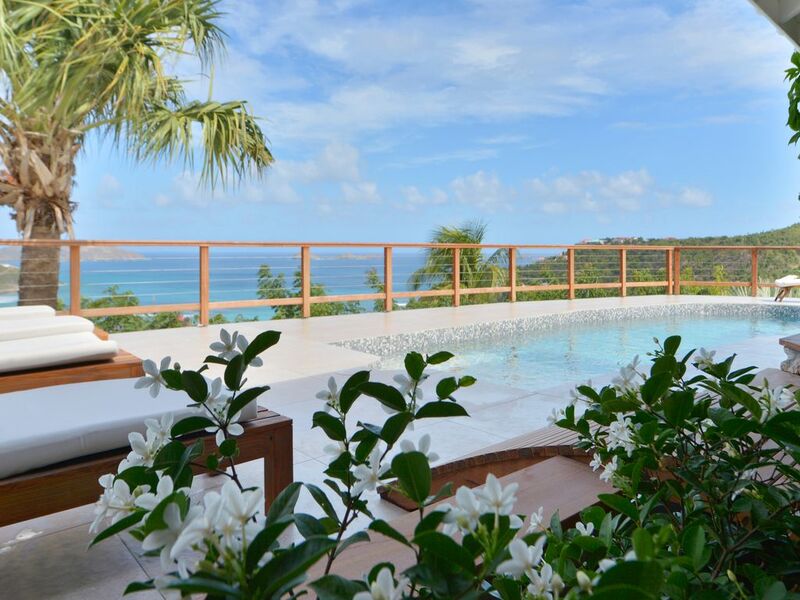 A breath taking panoramic view over the bay of St. Jean with the Eden Rock as the centerpiece. Simply the best place in St Barths, it is right at the heart of the island, "The Champs Elysee of St. Barths". A large spacious outdoor living area greets you for pure relaxation. In this villa you get a true taste of the exotic since you live mostly outdoors in spacious open spaces. The living room opens onto the dining area and there are two large dining areas and a wonderful sofa area overlooking the bay of St. Jean. Sunrise has four spacious bedrooms, each with a private bathroom. The 4th bedroom is located on the lower level and has an independent kitchen. The pool has an original pear shape and teak lounge chairs. All bedrooms have breath taking views. Sunrise is a beautiful villa where you can rest in a calm and peaceful environment. The garden is wonderful, there are tropical plants and little birds coming to greet you when you wake up in the morning. The place is unique and has a positive soul. You will feel at home. You can walk down the hill for a swim or breakfast in St. Jean. The best location on the island because you are at the heart of the island. My name is Maite Nouaille. I am an interior Designer, came to St. Barths the first time in 1982, and came back ever since. This tiny island rock is in my heart, once it grabs you, you are in trouble- you will always come back. There's something special about St. Barths, it is not so much how it looks, or how it is, it is how it makes you feel. Les Hauteurs de St. Jean, the "Champs Elysees of St. Barths!" I simply fell in love with the island; the first time I landed with the small airplane- I was glad to arrive! The island is beautiful, you feel free in St. Barths. You can get-up the morning, go for coffee at Maya's to go , you'll always meet someone you know. Then exercise in nature: start walking, go swimming or sailing. The light is magical and ever changing. The island is unique, everywhere you look, it's beautiful. The beaches all have their own personality. Above all, the island is safe, and people are friendly. The view over the Eden Rock!! Can't get over it. The villa is located in the best part of the Island. The views of St Jean Bay are the best. You will need no formal exercise as the walk up from the beach is a great workout but well worth it for your fantastic view. The exterior space is fabulous. We hosted a party with 20 people and had room to spare. Peggy, Jerome and Phillipe are very helpful when needed. I also rented villa Mystique previously. The difference between the two is that Mystique's bedrooms are slightly better and has an infinity pool but Sunrise has the awesome exterior space. Can't really go wrong with either one. You probably would want a 4 WD vehicle as some of the grades are steep coming up to the house and if it is wet you would like the extra traction. All in all, great time had by all. Thank you for taking the time to write this review. Jerome, Philippe and me were very happy to welcome you in villa Sunrise. You are a lovely family, we hope you will visit again soon. Big kisses and love from St Barths. Villa Sunrise hosted our family for our son's wedding week. It was our first time in Saint Barth's and the Caribbean. Our daughter and her husband joined us as did our Cousin Julie. We hosted 40-50 people for The Rehearsal Dinner at Villa Siunrise which was a perfectly comfortable and spectacularly situated event none of our guests will ever forget. Key to our experience was Peggy's guiding hand and Chef Bernard. They began planning with us months before our visit, met us several times during the week and performed marvelously at every turn. The food was a real treat, the best of what we asked for. However the experience, ambiance, relaxing with such a commanding view of Saint Jean's Bay and reuniting with family and friends gave us just the best memories we could have hoped for. We manage vacation property ourselves in Nantucket. Peggy met and exceeded all our expectations. Villa Sunrise is also located very centrally and comfortably inn Saint Jean, near shops and conveniences without the congestion of Gustavia. It is well equipped and spaceous. We strongly recommend it, especially for anyone seeking a gathering place for family and friends. We stayed at the villa in February, 2013, and had a wonderful week. There were three couples, and we stayed in the three upstairs bedrooms. There is a fourth bedroom on a lower level that we did not use. All bedrooms had nice bathrooms, mosquito netting on the beds (although bugs were not a problem), and beds were comfortable. There is a maid that comes daily and can do laundry if needed. The photos in the listing accurately reflect the overall appearance of the villa. The outdoor spaces are beautiful, the pool/fountain are perfect, the kitchen is adequately appointed and there is an outdoor grill. It is a very comfortable villa, not ultramodern, but cozy in an island setting, and private. We had no safety concerns. The best part of the villa is it's location. It has a beautiful view overlooking St Jean bay, Eden Rock resort, and the airport. (You cannot hear the planes but can watch them land and takeoff). You can walk down the hill to St Jean restaurants, shopping etc. Parking can be difficult, so this is especially helpful. After driving to other parts of the island, I was very hapy to be in St Jean. The owners met us at the ferry dock, helped arrange our rental car, and transport luggage. They live on the island and are easily accesible. There was a nice introduction to the villa on arrival, and a binder describing contact numbers, wi-fi connections, etc. They also helped us with our departure. The villa is fairly priced, and wiring money in advance was not a problem. I have traveled to a number of Carribean islands and stayed in villas. This experience was outstanding, and I would have no trouble returning or recommending to friends. St Barth is a fabulous island getaway. The View from Villa Sunrise was spectacular. Views of the airport, The Eden Rock and St. Jean Beach. Philip and Peggy were right there anytime we had questions or needed assistance. Amelia was extremely pleasant, quietly and efficiently cleaned around us. Overall a very pleasant stay. At first sight the villa was wonderful but as time went on it became apparent there were problems. The hot water tank wasn't turned on for 3 days in one of the ensuite bathrooms after many promises. The airconditioner in another bedroom went out about 2 am. We didn't open the windows because of the mosquitos. (No screens). The next day a new airconditioner was finally installed and finished about supper time. The septic backed up into 2 bedrooms. The plumbers had to bail out the septic tank. The smell was unbelieveable. The dishwasher didn't have hot water so the soap never dissolved. Beach towels went missing and the owner ask me if I had them. Turned out the maid had them in her trunk. The owner, Peggy, was always very helpful and apologetic. Nevertheless I started to wonder "what next"?? But it was our 50th anniversary and we took our 3 sons and their spouses. As I see it the house is old and paint covers a lot of sins but the inside is falling apart. I have been working for over 10 years in the villas, and this is a first. Even Mariah Carey that stayed in the villa was less difficult to please and more grateful. I have the duty to respond to your review. The AC did break in the "white bedroom" and was changed immediately the next day. This bedroom is equipped with Mosquitoes nets on all windows and a fan is placed in each bedroom, all previous guests could testify on the matter. I wish I could attach photos to prove the existence of mosquitoes nets. Perhaps you did not try to open the windows at 2 AM. Two professionals came the next day to change the AC, it did take them time which is normal (I wish I was a witch with a magical spell and the AC changed in 5 minutes) however I do not have such powers. AC installations anywhere in the world take hours instal (even with 2 technicians). The toilet was blocked with hygenic towels by one of the guest, and excess papers which explains why the conventional product to unblock the toilet did not work (sorry to be precise on that point), it is the first time I have guests who throw such items in toilet and obviously if the toilet had not been blocked in the first place, we wouldn't have had such problems. The plumber intervened rapidly and cleared the matter. I even came at night after the intervention to clean up, hence missing a part of my seven year old end of year school show. Dishwasher is new, has hot water (like all dish washers) however needs to be programmed properly in order for it to function. Thank you for your comment in saying that I was "helpful", I recalled you did crash a parked car, and I went out of my way to help. In all respect, please understand that St. Barths is a small island (it is not Texas), the team went out of their way to please you and obviously that was not enough. You also received a 15% discount on our trip for your 50th Birthday, perhaps you also expected a complete refund for your trip because your blocked the toilet? We wish you all the best in your future holidays in St. Barths and hope you will at some point comprehend that every little issue you experienced was attended- and in record time since this is a small island. I wish you all the best. When you celebrate a special occasion such as a 50th birthday with friends you want everything to be perfect. When we booked Villa Sunrise we had no idea just how much better than perfect it could be. We had never been to the Caribbean or St. Barths and did not know what to expect. Peggy was wonderful from the moment we contacted her and throughout our stay. She assisted us in the arrangement of the car rental, airports and connecting flights, restaurants, shops and a scuba trip. Her brother Philippe was also extremely helpful in picking us up at the airport and showing us around the Villa. The online pictures of Villa Sunrise are lovely but seeing it for the first time was breathtaking. The outdoor living space was our favorite and we spent our time there enjoying the sunsets. We enjoyed the pool in the afternoon and cooked a couple of meals on the barbeque. We loved the island and those who live there. All of the shop keepers were very friendly and we found amazing restaurants. And the beaches were stunning. We will be back and will encourage our other friends to join us so that we can book both Villa Sunrise and Villa Mystique. We could not have had a better time and Peggy was responsible for making it happen.